Cindy is a Clinician, and the Professional Development Supervisor for the MA and IL Helplines. She is a Licensed Social Worker and a Certified Community Resource Specialist. She has over 10 years of experience working in direct service programs in the city of Boston. She has provided one-on-one services to families experiencing homelessness or housing instability and provided HIV counseling and health education to high-risk populations. 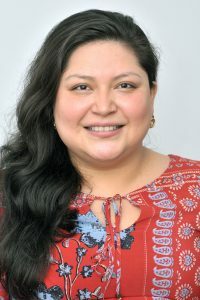 During her graduate studies, Cindy worked in Nicaragua and Colombia conducting social innovation and capacity building workshops in various communities. After completing her MSW at Boston College, she returned to Boston where she managed and directed programs serving low-income families. Cindy has deep knowledge of community needs and staff development, and is passionate about using a strengths-based and popular education approach to her work.